The organizer of 14th PZU Warsaw Half Marathon is Warsaw Marathon Foundation. 15 Brylantowa str., 05-077 Warsaw, registered under Taxpayer Identification Number (NIP) 9521913280 and Business Identification Number (REGON) 015438288. Contact with the organizer is available via phone: (+48) 737-444-810 and (+48 22) 749-13-33 (number not available between 28th and 31st of March 2019), by email: info@warsawmarathon.com or by ordinary mail to the mailing address: Fundacja Maraton Warszawski, ul. Grochowska 8c, 04-217 Warszawa, Poland. The race will take place on 31st of March 2019 in the streets of Warsaw. The race will start at 10:00 am. The starting line will be closed after around 30 minutes from the start signal. The distance of the course is 21,0975 km. The course is approved and certified by Polish Athletic Association (PZLA) and IAAF. The exact course of the race will be announced on the website pzupolmaratonwarszawski.com. Organizer has the right to change the course and in such an event will inform the participants by posting a new course on www.pzupolmaratonwarszawski.com. Such a change shall not create any additional claims and/or liabilities. Every kilometer of the course will be marked with vertical and horizontal signs. The start area will be divided into pens. Participants shall enter the appropriate pen according to the color of the starting number. The color of starting number is set on the basis of result declared by the participant during in the registration form. The declared result can be changed until 28th February 2019. The organizer does not guarantee that the participants who settle the entry fee after 28th February 2019 will get the pen (the color of the starting number) in accordance with their declared result. Time limit of the race is 3 hours 30 minutes counted from the start signal. Time limit on 10th is 1 hour 45 minutes. The participants who will fail to complete the race within the time limit or will not cross the lines mentioned in the previous point in the time limit stipulated above are obliged to give it up and leave the course or come to the finish line by especially prepared “END OF RACE” bus. Only individuals who are at least 18 years old or who will turn 18 at least on the day of the race, i.e. on 31st of March 2019, are allowed to participate in the race. by an authorized person – on the basis of signed by the participant race card (available to print out form the event website around two weeks before the race) and photocopy of identity document of the participant. The address of the race office will be announced at a later date. 29th of March 2019 (Friday) – 12:00 pm. – 8:00 pm. 30th of March 2019 (Saturday) – 10:00 am. – 8:00 pm. In the race office every participant will receive an individual race kit with, among others, starting number, time measuring chip, safety pins and keepsake T-shirt (according to the selected option of race kit). T-shirts in the race office will be distributed pursuant to previous declaration of participants. T-shirt size shall be choosen in the application form. Change in the size will be possible in the application form but not later than on 19th of March 2019. The number of T-shirts in each size is limited and the availability of each size is not guaranteed at all times. The organizer does not guarantee receiving T-shirt in declared size. Race kits not collected in the race office will not be neither sent nor distributed in any other way at a later date. During the race all participants shall have their starting numbers horizontally attached to the front of their race tops (alternatively sweatshirt or jacket). Starting number shall be visible during whole race. Covering (in part or in whole during whole race or its part) or modification of starting number is forbidden under the penalty of disqualification. Participants are also obliged to properly install the time measuring chip (as stated in its instruction). The organizer allows the start of participants on wheelchairs with direct manual drive. After filling in the application form where he/she declares the will to start on wheelchair, the participant shall sent and email to info@warsawmarathon.com with a document proving his/her disability attached – it is obligatory for exemption from fees. It is not allowed to start on vehicles: with indirect drive (e.g. handbike) or rim-push type. 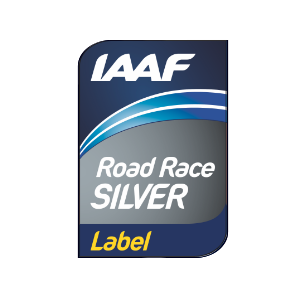 Participants of the race are obliged to follow the Regulations of the race, and rules of PZLA and IAAF. The organizer provides medical care on the starting line, along race course and on the finish line. In order to register for the race one shall fill in the registration form available at pzupolmaratonwarszawski.com and https://rejestracja.maratonwarszawski.com/en/ or send a paper application to the address of Warsaw Marathon Foundation stated in point I.2. Registration is considered to be complete when following conditions are met: application form is filled in and the entry fee payment is credited to organizer’s account. ordinary path – filling in registration form available on event’s website and settling the entry fee. charity path – taking part in the charity action #BiegamDobrze regulated in separate regulations. Online registration will be closed on 30.03.2019. Signing up for the race will be also possible personally at the Race Office of the 14th PZU Warsaw Half Marathon, provided that the total pool of starting numbers for those who register after 28.03.2019 and available at the Race Office is 200. The Organizer reserves the right to close the registration before the abovementioned date if the limit of participants indicated in Section V. 4 is reached prior to it. To participate in 14th PZU Warsaw Half Marathon it is necessary to pay the entry fee. People who will settle the entry fee after 24th of March 2019 and will not receive the confirmation with starting number will have to present the confirmation of the payment in the race office in order to receive their starting number. If the payment is made in an insufficient amount (e.g. as a result of exceeding the deadlines listed in the Regulations) the remaining difference to the amount that should be transferred according to the date of the first transfer must be paid by the participant. For settlement and safety of transactions is responsible PayU S.A. with the registered office in Poznań, 60-166 Poznań, at ul. Grunwaldzka 182, having tax identification number NIP: 7792308495, REGON 300523444, a domestic payment institution supervised by the Polish Financial Supervision Authority, entered into the Payment Services Register under number IP1/2012. People born in 1954 or earlier pay 50% (kit without T-shirt) of the entry fee applicable at the time of entry fee settlement. Holders of subscription card of magazine “BIEGANIE” are entitled to get a 15% discount on basic entry fee (kit without T-shirt) applicable at the time of settling the entry fee. The card must be valid at the date of settling the payment and on the day of the race. Attention! People born in 1954 or earlier are not entitled to combine the discounts – the valid discount will be the one mentioned in the point number VI.4. Participants starting on wheelchairs are entitled to participate in the race free of charge (kit without T-shirt), the obligatory condition is email to info@warsawmarathon.com with document proving disability attached. The organizer is not liable for the loss of registration form, money order or bank transfer by the fault of post office or a bank. Transfering entry fee will be lowered by €8 (20zł) as a operational charge. Participants who want to receive an invoice for the paid starting fee should select the appropriate option in the registration form and enter the required data needed to issue the document. The invoice will be generated automatically after the payment has been credited and will be made available for downloading from the participant’s profile by the 15th day of the month following the month in which the payment took place. In accordance with tax regulations, due for payment before the service, advance payment invoice will be issued covering the full amount of the entry fee. Advance payment invoice is then the final invoice. Stating the will of getting invoice participant agrees to transfer/share of invoices without the recipient’s signature in electronic form. This consent does not exclude the right of the organizer to issue and send invoices in paper form. Participants will receive a special deposit bag in the race kit which will allow them to leave their deposit in a special deposit area. The deposits will be given back only on the basis of starting number. In case of lost starting number the organizer is discharged from any liability for giving the deposit to someone else. Attention! It is forbidden to leave valuable objects and documents in the deposit. Participants have possibility to use changing room before the race. After the race there is possibility to use changing room, massage and shower. Every participant who is willing to book a free sleeping place before the race has to inform Warsaw Marathon Foundation about it by filling a form at http://pzupolmaratonwarszawski.com/nocleg/ until 28th of February 2019. The organizer provides free sleeping place in a sports hall during the night from 30th to 31st of March 2019. The organize does not provide neither mattresses nor sleeping bags. Notes about granted sleeping place will be available in the information point by the race office. Only after presenting this note participants will be allowed to enter the sports hall. It is forbidden to bring and consume alcoholic beverages and other stimulants in the sports hall as well as to be under the influence of alcoholic beverages and other stimulants. The participants who will break this rule will be automatically dismissed from the sports hall. Refreshment points with water will be located every 4 km starting from 5th kilometer. There are four refreshment points along the course. The organizer does not take any personal dietary supplements from participants. Portable toilets are located nearby each refreshment point. Time splits will be taken at kilometers 5, 10, 15 and 20. The stuff working at time splits notes down starting numbers of participants taking shortcuts. Participants who take shortcuts or change the course are disqualified. Electronic time measurment is the basis of classification. Special measuring mats, which will indicate the presence of the runner in the place, will be placed along the course. In the event where participant is not indicated by given time measuring mat, he/she may be disqualified. The general classification is based on real time (net – measured from crossing the starting line). The exception is the first 200 participants crossing the finish line – they are classified on the basis of official times (gross – gun), provided that if within the first 200 people at the finish line there are at least 8 men and 8 women, if not the number of 200 people will be enlarged to meet this requirement. Every participant will receive information about both gross and net times in final results. Unofficial results will be posted on pzupolmaratonwarszawski.com just after the race. The results of branch categories will be announced in the internet in three days after the race. Written complaints about the results can be sent to info@warsawmarathon.com untill 2nd of April 2019, 6.00 pm. The complaints will be considered within 48 hours and final and official results will be announced on 13th of April 2019. The certificate of completion of 14th PZU Warsaw Half Marathon will be available to print out in 14 days after the race at pzupolmaratonwarszawski.com. The organizer reserves the right to introduce additional categories. Every finisher of 14th PZU Warsaw Half Marathon will receive a finisher’s keepsake medal at the finish line. The finishers of places 1-3 in general categories for men and for women as well as the finishers of places 1-3 in age categories will receive keepsake trophies. The organizer may offer other trophies and prizes in categories of their choice. Personal data of participants will be processed in accordance with the applicable provisions, in particular Regulation (EU) 2016/679 of the European Parliament and of the Council of 27 April 2016 on the protection of natural persons with regard to the processing of personal data and on the free movement of such data, and repealing Directive 95/46/EC (General Data Protection Regulation). Processing of data mentioned in point XI.1. also includes the publication of: name, surname, date of birth, city and name of the club. Detailed information about processing of personal data is included to Annex 1 to this Regulations. Staying on the route of 14th PZU Warsaw Half Marathon without a valid start number is prohibited. People without valid start numbers will be removed from the route by the service crew of the run. No inline skates, bikes, nordic walking sticks or other devices are allowed without the organizer’s permission. Running with dogs is also prohibited. Only vehicles of the organizer with valid pass issued by the organizer have access on the route (bicycles, motorcycles, cars). In order to obtain an individual consent for the start with a pram, the Participant shall send a scan of his/her STATEMENT to info@warsawmarathon.com and deliver the original to the Race Office by the race kit collection. During the race participants shall obey orders given by services responsible for safety, emergency services and other staff members appointed by the organizer. The organizer assures personal accident insurance during the race. Every participant is obliged to sign the declaration of acquaintance with rules and regulations of the race. By signing the declaration participant agrees for giving to him/her first aid by medical and paramedical services and for medical treatment and the transportation of the participant to safe place in case of emergency by services approved by the organizer. The participant declares that he/she is able to take part in the race and that he/she has no knowledge of any reasons connected with his/her state of health that could exclude him/her from participation in the race and that he/she takes part in the race on his/her own responsibility. The participant notes that participating in the run is connected with physical effort, natural risk of accident, body injury and physical trauma (including death) and material loss. Additionally, other risks which are unforeseeable now can occur. Signing this document means that the participant considered all the risks connected with the run and will start the run on his own responsibility. All the decisions made by medical service during the race about the continuation of the race by the participant are final and binding. A random obligatory doping control will be carried out after the race. By signing up to participate in the race the Participant accepts these Regulations and agrees for the free use of his image in the form of photographs or video recordings, and grants the Organizer free of charge license to use it in all fields of use, including printing/saving and spreading in any form and keeping in computer memory; to use it for promotion of the events organized by Warsaw Marathon Foundation; to share it with sponsors and partners of 14th PZU Warsaw Half Marathon for their promotion in the context of participation in the event; to post and publish it in the publications of Warsaw Marathon Foundation and on promotional printed materials of the Organizer, in press, on websites and in television and radio programs. The organizer reserves the right to cancel or postpone the race without justification. Placement of advertisement materials on the elements of event infrastructure (i.e. fences, gates etc.) constitutes an exclusive right of the Organiser and is reserved especially for the official sponsors/partners of the race. It is not allowed to place any advertising medium along the course of the race and in the areas used for the organisation of the event (e.g. starting line zone, runner’s village) without prior consent of the Organiser. Only the organizer of 14th PZU Warsaw Half Marathon has the right for binding and final interpretation of these regulations. The organizer makes final decisions in matters not stipulated in these regulations. If any of these regulations are considered fully or in part as invalid or impossible to execute the rest of the regulations will stay (fully or in part) valid. The administrator of your personal data is the “Warsaw Marathon” Foundation with its registered office in Warsaw at 15 Brylantowa str., 05-077 Warsaw (registered under Taxpayer Identification Number (NIP) 9521913280, Business Identification Number (REGON) 015438288, National Court Register (KRS): 0000152754). Contact with the personal data administrator is possible at info@maratonwarszawski.com. For what purpose and on what basis are your personal data processed? Providing personal data is necessary for both your participation in a race and keeping your account on the registration website rejestracja.maratonwarszawski.com. Failure to provide your personal data makes it impossible to conclude the agreement and participate in the race. Your data will be processed during the period of using the rejestracja.martonwarszawski.com website and participation in races for which you register via the Website. At the end of this period, your data will continue to be stored for purposes arising from law (especially tax and accounting), as well as counteracting fraud and abuse and seeking possible claims under the agreement. Part of your data (especially those that are included in the results of the race) can also be processed after this term for statistical and archival purposes. Who will be the recipient of your personal data? Your personal data will be disclosed to employees, associates and subcontractors of the Administrator to the extent necessary for the implementation of the aforementioned purposes of processing personal data. Starting lists and results containing basic personal data will be publicly available, including the publication on the website of the race. What rights do you have for the processing of your personal data? You have the right to request: access to your personal data, correction, removal and restriction of their processing. In addition, you have the right to object to the processing and transfer of them. In addition, with respect to processing that takes place on the basis of your consent – you have the right to revoke it at any time. Who can you complain to about how your personal data is processed? You can submit a complaint to the supervisory body: President of the Office for Personal Data Protection, 2 Stawki str., 00-193 Warsaw. In team classification may start teams representing sports clubs, firms, institutions, other gatherings and groups of competitors starting under one common name. Team has to constitute of at least 4 people including at least one woman. There is no upper limit as far as the number of team members is concerned. Participants who are members teams are also obliged to follow the rules and regulations of 14th PZU Warsaw Half Marathon. One participant can represent only one team. As the final result of the team shall be regarded the sum of four best real (net) times achieved by its members including minimum one of a woman. The winning team is the one whose sum of four above mentioned times is the lowest. In the event where the race is finished by less than four participants representing a team or the race is not finished by any of female members of a team, team will not be classified. Captain registers his/her team by sending attached form filled in with names, surnames, dates of births and starting numbers of all team members to info@maratonwarszawski.com. The forms shall be sent until 17th of March 2019. After this date no changes in team line-up and no registering new teams will be possible. Team classification is conducted as general classification. There is no age groups division. The organizer has right to introduce additional classification in the scope of team classification. Only the organizer of 14th PZU Warsaw Half Marathon has the right for binding and final interpretation of the Regulations. The organizer makes final decisions in matters not stipulated in these regulations.